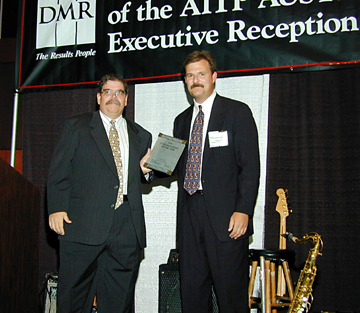 On November 8, 1999, the Austin chapter of the Association of Information Technology Professionals (AITP) presented the second annual Austin IT Executive of the Year Awards in conjunction with the ITEC Expo - the region's largest gathering of IT executives, educators & vendors. The ITEC/AITP awards ceremony was held at the Austin Convention Center, and it was attended by over two hundred area IT professionals. "We hope to build a important who's who roster over the years as we continue identify and honor Austin's best technology executives," states Austin AITP President, Russ Finney. "Holding this event in association with the ITEC Expo only strengthens the award's significance." On hand as the evening's featured speaker was The Honorable Mayor Kirk Watson. 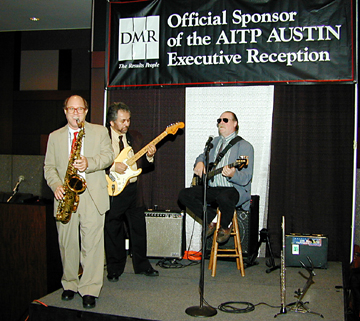 The primary sponsor of the event was DMR Consulting Group. Two major awards were presented: The Austin IT Executives of the Year, and The Austin Information Technologist of the Year. Jerry Olivier designed, developed and implemented the shared bandwidth Premise Distribution System presently in place at Austin Bergstrom International Airport (ABIA), which opened May 23, 1999. Jerry designed the entire airport facility as a dedicated telecommunications campus with a single demarcation point. This eliminates the requirements for multiple telecommunications systems and allows the Department of Aviation the ability to properly manage the Airport's facilities. All telephony and data utilizes a shared bandwidth Premise Distribution System provided by the airport. In addition, ABIA provides full telephone service to tenants through a Shared Tenant Service arrangement. Shared Tenant Services at ABIA are designed to utilize the telecommunications infrastructure of the airport to provide state-of-the-art, competitively priced voice, data and video services to all tenants and to allow for maximum flexibility and scalability. The use of STS and PDS systems are becoming standard in airports around the world. The need to maximize expensive infrastructure investments coupled with the demand for increased bandwidth is resulting in a trend to shared data and telecommunication resources. Advancements in switching technology are leading to more robust, reliable networks. ABIA is among the first airports in the United States to fully integrate voice, data and video on a shared Premise Distribution System. All tenants at ABIA must use the system at one level or another. The STS marketing strategy maximizes the revenue from each potential customer by tailoring service offerings to meet demand. Jeff Tyler, Chief Information Officer, Collective Technologies, was responsible for building the infrastructure and business processes needed to successfully manage a rapidly growing systems management consulting firm. The strength of Collective Technologies is the ability for its consultants to communicate and share information with each other anywhere around the world in order to collectively solve a client's systems management problems. Tyler was presented with the challenge of ensuring that all Collective Technologies team members, across the globe, have real-time access to all of Collective Technologies' resources. In response to this challenge, Tyler created a custom Perl/CGI program with a web interface, running on an Oracle back end, providing the needed infrastructure that allows Collective Technologies team members to stay in constant communication with one another; which is essential to Collective Technologies' success. Joining Collective Technologies in 1994 as a systems manager, Tyler has served as the company's Regional Director for the New England area as well as Director of Information Technology. Tyler now serves as Collective Technologies Chief Information Officer, bringing over twenty-five years of systems management experience to the company. Tyler leads a team of 15 Information Technology team members responsible for supporting the needs of over 450 consultants, sales staff and management teams across the globe. Tyler is responsible for training, motivating and leading his team; giving them the opportunities to develop new skill sets and grow their careers. Tyler has built a virtual IT department that relies on teamwork and the sharing of ideas. 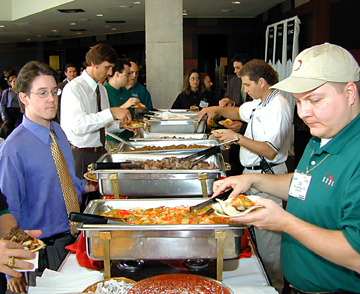 Although Tyler is the individual nominated for this award, he would be the first to say that it is truly through the accomplishments and achievements of the entire IT department that Collective Technologies now has the tools, systems and business processes needed to compete and succeed in the systems management market place. The independent selection committee for determining the final nominees, as well as the final award winners, was an outstanding representation of five recognized technology leaders. The panel of judges for this years awards included Steve Madere, Founder, Deja.com, and Past CTO of the Year winner, and Laura Kilcrease, Founder, Austin Technology Incubator. "We are very pleased to be able to single out these deserving executives," said AITP President Russ Finney. "They are in very good company with last year's winners, Dell CIO, Jerry Gregoire (1998 IT Executive of the Year), and Deja.com CTO, Steve Madere (1998 Information Technologist of the Year). Our call for nominations produced a significant number of deserving candidates. Our judges really had their work cut out for them." Neil Webber, the founder and CTO of Vignette, has lead the conception, design and delivery of all of Vignette's internet software products, which have won over 10 awards since their introduction in 1997, including Red Herring Magazine's 1998 Best Product of the Year. Vignette's products have in turn been selected by over 150 Fortune 2000 companies who are responsible for the Web's most successful e-commerce and publishing ventures, including Ziff Davis, CNET, National Semiconductor, American Airlines, and Bank One. Most recently, Neil has championed the ICE initiative, and industry wide group of over 80 companies including Vignette, Microsoft, Sun, and Adobe, who have developed a groundbreaking new internet specification for content syndication services using XML-based technology. This ICE specification has begun to serve as the basis for a whole new category of internet-based software products and content services that will allow businesses to connect together and create online distribution chains for their content and services through other companies Web sites. Neil was instrumental in both the technical design of the specification as well as providing the executive leadership in bringing such a large group from concept to completion of the specification in less than 10 months. In addition to his executive duties as cofounder and CTO of Vignette, Neil regularly provides group focused and 1:1 leadership to a team of over 100 engineers who collectively represent one of the strongest software teams in Austin. Neil is saught after for his unparalleled technical perspectives as well as his soft, metered style which makes even the most junior engineer comfortable in seeking advice from him.